Sacramento Republic FC started quickly the scoring in the 7th minute. Defender James Kiffe beat his man down the left side of the pitch and then promptly sent the ball low and into the box where forward Justin Braun slid and sent a one-touch left-footed flick shot into the back of the net for the early 1-0 lead. Orange County Blues FC would answer with a goal in the 43rd minute. Forward Denzel Slager got behind the defense with speed and got a one-on-one situation with Republic FC keeper Patrick McLain. Slager’s strong shot got the ball past McLain even with the keeper getting a hand to it, capitalizing on the counterattack opportunity. The match would remain tied 1-1 going into the half. The Blues wasted no time and in the 46th minute took the lead. The Blues got the ball into the box and after a weak deflection just outside the box. Midfielder Didier Crettenand charged and sent a one-touch screamer past McLain for the 2-1 lead. Sacramento Republic FC gained an advantage in the 60th minute when Blues midfielder Luka Petričević was sent off with a straight red card after a hard tackle. Republic FC would pressure The Blues for the final half hour of the match but, unfortunately would not be able to capitalize on a number of late chances including an unmarked shot from captain Justin Braun that sailed over the crossbar and out of play. 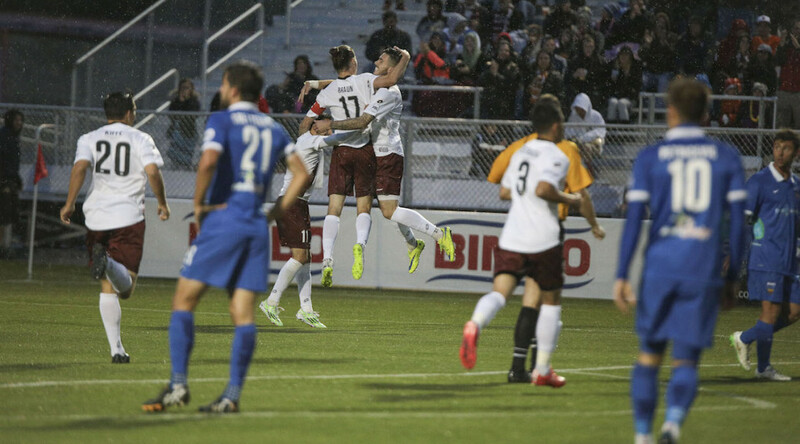 Republic FC will be back in action on Wednesday, April 29 when they take on Real Monarch SLC in Salt Lake City, Utah. The match will be streamed live on SacRepublicFC.com/matchday. Orange County Blues FC – Pepe Miranda; Josh Suggs, Romeo Filipovic, Brenton Griffiths, Jimmy Turner, Luka Petricevic, Didier Crettenand, Junior Burgos (Jacob Barron 55), Denzel Slager, Nikola Ilich, Christofer Ramirez (Amani Walker 84). Stats: Shots: 9, Shots on Goal: 3, Saves: 3, Fouls: 13, Corner Kicks: 1, Offside: 3. Sacramento Republic FC – Patrick McLain; Emrah Klimenta, Mickey Daly (Derek Foran 36), Nemanja Vuković, James Kiffe (Agustin Cazarez 45); Max Alvarez (Gilberto 45), Ivan Mirković, Octavio Guzman (Thomas Stewart 64), Rodrigo Lopez; David Estrada, Justin Braun. Subs Not Used: Dominik Jakubek, Zev Taublieb, Joaquin Rivas. Stats: Shots: 11, Shots on Goal: 4, Saves: 1, Fouls: 6, Corner Kicks: 5, Offside: 3.